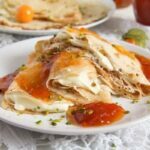 Soft and wonderful Polish crepes – Nalesniki – filled with a smooth, sweet and delicious quark cheese filling. The same words. Every time! 🙂 And I make the crepes. Unlike my grandmother, who would only make crepes about 2 or 3 times a year, although I loved them so, because she didn’t want our apartment to stink of frying crepes. Funny enough, she would make fries (which I didn’t like, but she did) at least once a week and she never complained about the smell then. And they smell worse than crepes, if you ask me… I need a therapist! Anyway, I drifted away again… So, my family loves crepes and I make them all the time. Usually, regular crepes filled with sugar or jam or ham and cheese. But now and then I try something more unusual, like the Crepes with Creme Fraiche and Rhubarb Compote, the Green Wild Garlic Crepes or the Beetroot Crepes with Cream Cheese and Horseradish Filling. Today’s Polish Crepes with Sweet Quark Cheese Filling – Nalesniki are a bit more special than my usual crepes as well. Not so much the crepes themselves, but the filling. We had these wonderful crepes during our holiday in Poland, they were part of the breakfast almost every morning. I liked them so much, I had to make them myself as well. And funny thing, my children didn’t like the hotel crepes at all (no idea why, I thought they were great), but they loved my homemade version. And although I liked those in the hotel very much, I must say I like my version better, so much that I have made them 5 times already since October. I always make a huuuuge batch of crepes, which each one of us can fill to their taste. A small bowl of quark filling has become a regular already. Making crepes is easier than you might think. Just whip together the ingredients, let them rest for a while and fry the crepes. Fill them with whatever you like, either sweet or savory and enjoy. Whip up the ingredients preferably using a hand-held mixer or a blender, if you like. My grandmother used to whip the ingredients with a regular whisk and I used to do it that way myself, however nowadays I find that using an electric mixer not only speeds up the process, but makes the batter smoother and nicer to work with. However, when using an electric mixer you definitely have to let the batter rest for a while. When you mix the ingredients, there will be a bit of foam forming, and if you start making the crepes immediately, the crepes will be full of holes. So make sure to let the batter rest until the foam disappears, about half an hour should be enough. But, if you want you can make the batter well in advance, well covered it will keep for up to 3 days in the fridge. In this case the batter will thicken considerably, but you can easily thin it again by adding a bit more milk and stirring well, with a regular whisk this time, so that the foam will not form again. Usually, I only use milk when making crepes, but I remember than my grandmother, who never made anything with milk, used to take sparkling water instead. 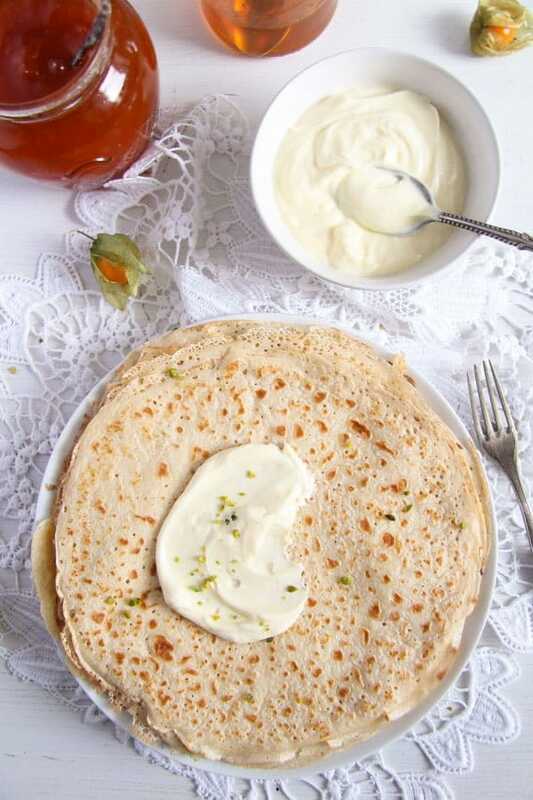 For the Polish Crepes with Sweet Quark Cheese Filling – Nalesniki I used a mixture of milk and sparkling water and I loved the result, I find that the sparkling water makes the crepes even softer and fluffier than they usually are. I don’t normally add sugar to the batter. First of all, because I remember my grandmother always saying that if you add sugar to the pancake batter, the pancakes will stick to the pan. I don’t know if that is true, because I have never taken the chance, but that may have something to do with my grandmother’s pans probably, she never had a non stick pan like I do. 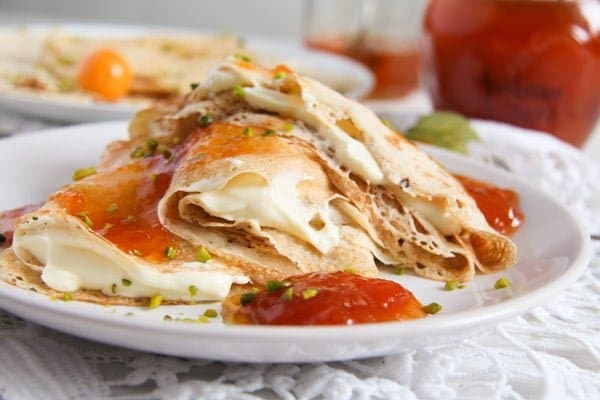 Secondly, I always fill part of the crepes with ham and cheese and sometimes with other savory filling, so sugar would not be suitable in this case. And, when eating sweet pancakes, you already have the sugar in the filling, so why on Earth would you want to add sugar to the batter as well? , I got one about 4 or 5 years ago and I still use it. And I really thinks it makes a difference. The crepes look better, cook faster, there are far less ruined ones in the batch and I only need a tiny amount of fat when frying them. I pour a few tablespoons vegetable oil in a small bowl and only brush the pan lightly between the crepes. And remember, no matter what pan you use, the first crepe will probably break. Just pop it in your mouth immediately and forget about it! Keep the crepes warm in the oven at about 100 degrees Celsius/ 210 degrees Fahrenheit. You could even reheat them later, either in the microwave (I read about it, but never did it myself, I don’t have a microwave) or in the oven (I do that often). Just place the crepes on a baking tray lined with baking paper, cover them with foil and reheat in the preheated oven at 180 degrees Celsius/ 350 degrees Fahrenheit. It should take between 5 and 10 minutes, just check if they are warm. You could also reheat them in the pan, just for a few seconds on each side and make sure you don’t burn them. Heat the pan over medium-high heat. Pour some vegetable oil in a small bowl. Brush the pan with a little oil. Use a soup ladle to pour the batter into the pan. Take the pan into the left hand (if you are right-handed) and pour the batter into the pan. Slowly rotate the pan to make sure that the batter spreads evenly onto the bottom of the pan. Cook the crepe for one or two minutes on the first side, until the bottom of the crepe is lightly browned and the top looks set. Loosen the crepe by going around the edges of the pan using a rubber spatula, then flip it on the other side using the spatula. Fry the second side for only about half a minute. Stack the crepes together on a plate and keep them warm in the oven while you make the rest. 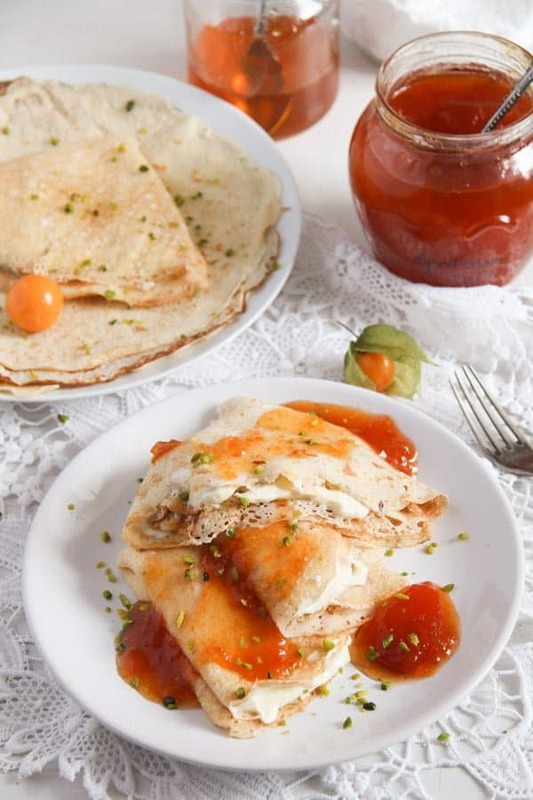 In the case of the Polish Crepes with Sweet Quark Cheese Filling – Nalesniki with the quark filling below. Otherwise with whatever filling you like! 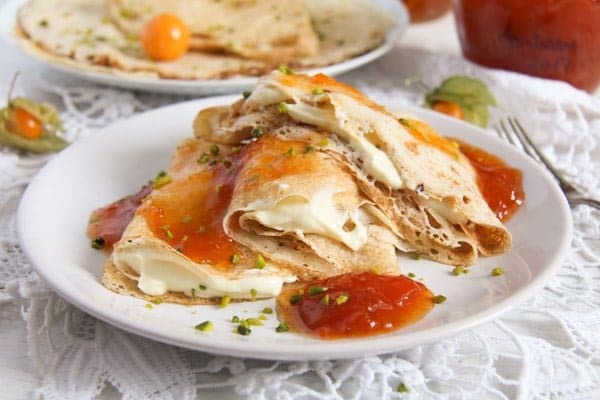 Sweet filling: sugar, jam, compote, cottage cheese with honey and banana slices, any other fresh, canned or stewed fruit or berries, nutella, ice cream and so on. Savory filling: ham and cheese, only cheese (different sorts), ground meat sauce, chicken with various sauces, stir-fried vegetables and so on. Give all the ingredients for the batter to a mixing bowl. Mix well with an electric mixer, then cover and let rest for at least half an hour, most of the foam that has formed should be gone. In the meanwhile make the filling. The egg yolks in the filling will remain raw, so use pasteurized eggs, if that worries you. Give all the ingredients to a bowl and mix well until smooth. Cover and keep refrigerated until ready to serve. or another shallow non stick pan on a medium-high heat. Pour some vegetable oil in a small bowl. Brush the pan with a little oil. Use a soup ladle to pour the batter into the pan. Take the pan into the left hand (if you are right-handed) and slowly pour the batter into the pan. Slowly rotate the pan to make sure that the batter spreads evenly onto the bottom of the pan. Keep in mind that the crepes should be thin, so don't give too much batter to the pan, just enough to cover the bottom of the pan with a thin film of batter. Give some of the filling onto the crepes and either roll or fold them. Serve warm with a small dollop of jam (I had apricot jam), if you like. I just love reading about your grandma, she had such a strong personality. 🙂 I’ve also never tried adding sugar to the batter, I guess it becomes caramelized in the pan and might stick to it… or it would make the crepes less soft. 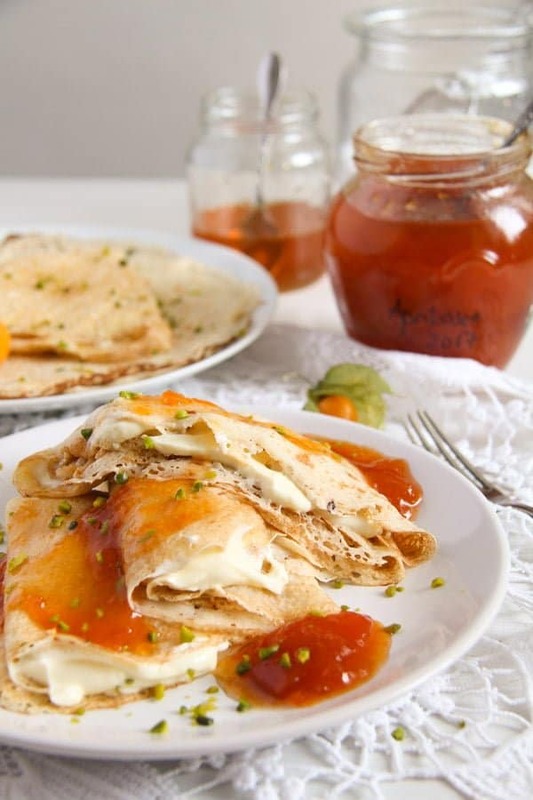 Your crepes look perfect, and this combination with quark and jam sounds yummy! Add the sugar if you want to, it will not stick to the pan. When I make crepes I never add sugar or flavours (vanilla or something else) as I might make them with savoury filling too. But, when I make pancakes (thick ones), I sometimes add sugar and they are fine. I heard that so many times from my grandma, I was always afraid to actually try it… 🙂 🙂 But it is good to know that it works. But most of the times when I make crepes I fill half of them with ham and cheese, so I prefer to leave the batter plain. Your crêpes bring back childhood memories… but yours look much lighter and thinner! The Polish traditional ones are usually thicker and almost as filling as bigos 😉 Though maybe nowadays some people make healthier, thinner crêpes. Nice idea to serve them with apricot jam! Sparkling water in a crepe recipe? That’s a new one for me. That I’ve got to try. This dish just looks so irresistibly good that I’m just going to have to give it a try. Your pictures are incredible. Thank you, MJ. Sparkling water makes the crepes really fluffy, you should try it. Crepes are just a perfect dish for me, I could eat them anytime and with any kind of filling, well except with nutelly, my kids love that but I find it terrible… 🙂 Quark is really good and healthy and you can buy it anywhere in Germany, it’s probably even cheaper than yogurt. I was thinking about making it at home and posting a recipe, I used it quite often in my recipes, maybe it would not be bad to offer a recipe for homemade quark for the American readers. Strained yogurt or whipped cream cheese would taste great as well in this combination, I am sure.